In the dark alleyways of publishing, an author uprising is brewing against Big Publishing. I’ve been thinking a lot about revolution lately thanks to the events unfolding in North Africa. My wife, Lesleyann, has friends in Egypt, and they’ve kept us up to date via email. Their dispatches alternate between fear, uncertainty, optimism and celebration. Revolutions are an awkward and messy business. They represent the end of one paradigm and the beginning of the next. While the root causes can trace back decades, when the uprising arrives it can occur with alarming rapidity. The events in North Africa have recalibrated the meaning of "revolution" for me. I’m thinking now about revolution in the context of a popular uprising. At the heart of any revolution is a loss of faith in the prevailing regime. In Egypt’s case, a number of catalysts precipitated the revolution; chief among them an oppressive political environment that offered little opportunity for democratic participation, freedom of speech and economic opportunity. Frederick Nietzsche wrote, “God is dead.” I recall my philosophy professor at U.C. Berkeley 25 years ago explaining the quote with great passion. He said the beauty of the quote went beyond its immediate religious connotation – it was a metaphor for the power of faith. When you believe in something, your faith powers that in which you believe. If we lose faith in an institution, a regime or a belief system, the very survival of that institution is imperiled. Every institution is powered by faith. If your house catches on fire, you have faith the local fire department will respond. If you purchase a tomato from your local farmer’s market, you have faith the item you purchased will indeed taste like a tomato. Often, faith is based on some future expected result. You can’t touch, smell or see it in the present. If we are rewarded for our faith, such as trusting that fire truck to come when we expect it, then our faith in that institution is reinforced. Faith is the single most important force-of-nature driving all human experience. Faith, religion, revolution, and publishing. Trust me, I’m going somewhere with this. The embedded PowerPoint below represents my attempt to pull it all together and make sense of where the publishing world is headed. 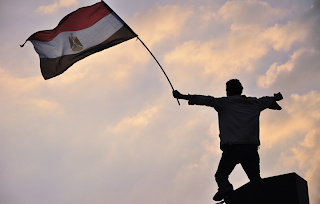 In the presentation, I draw parallels between the catalysts for the Egyptian revolution and the author uprising I foresee taking root in publishing. If authors – the beating heart powering Big Publishing – lose faith in Big Publishing, then big publishing as we know it will die. By “Big Publishing,” I’m referring to the old, pre-self-publishing system embodied by the Big 6 New York publishers, in which the publisher serves as the author’s judge, jury, gatekeeper and executioner. If Big Publishing approves of your book, they acquire it. Post-acquisition, an author can die happy knowing they’re a published author with all the esteem, respect and future possibilities embodied in this blessing. At least, that's what most authors are trained to believe. Unfortunately, it’s tough to find a traditionally published author who waxes eloquent about their post-publication experience. It’s like the author goes to heaven and reports back via John Edward (the guy who talks to dead people) that they discovered famine on the other side of the pearly gates. Big Publishing, although it employs thousands of talented and well-intentioned professionals, is built upon a broken business model. The cracks are growing more apparent, and before long, authors – both traditionally published and otherwise – will lose faith in the institution. When that happens, the seeds of revolution are sewn. Some might argue we’re already there. What can a publisher do for me that I (the author) cannot do for myself? Might a big publisher actually harm my prospects as an author? Ten years ago, the answers to these simple questions validated the need for Big Publishing. Why? In the old print world, Big Publishing controlled access to readers. They controlled the printing press and the access to retail distribution. Yet these same questions asked today yield mixed results. In the last four or five months, Joe Konrath started urging readers of his blog to abandon Big Publishing (he calls it “Legacy Publishing”). He contends indie authors can produce, publish, price and promote a book more effectively than Big Publishing. Amanda Hocking, in her recent interview with USA Today, was quoted as saying, "I can't really say that I would have been more successful if I'd gone with a traditional publisher." No doubt, much of Hocking’s success is because she’s an indie author. She writes great books her readers love. She prices her series-starters at only $.99 and the rest at $2.99. Great books + low prices + enthusiastic fans + an author directly engaged with her fans = viral readership. Few big publishers are prepared to play by these new rules. Every week we hear of self-published authors who were previously rejected by Big Publishing finding success with self-published ebooks. My presentation lists 50 Indie Ebook Authors to Watch. Brian Pratt, profiled here in December, is one such author. Ruth Ann Nordin is another. Nordin's An Inconvenient Marriage is the #2 best-selling romance title today in the Apple iBookstore’s romance category, and #35 among all paid titles at Apple. Two or three years from now when ebooks account for more than 50% of the book market, the same two dangerous questions above will yield a more unequivocal answer in favor of self-publishing. All the major ebook retailers – Apple, Barnes & Noble, Sony, Kobo and Amazon – have embraced indie ebook authors and grant them equal shelf presence alongside Big Publishing authors. Smashwords is now distributing over 20,000 titles to most of these retailers (we're not at Amazon yet). Readers, not publishers, decide what sells. I agree with all of what you've said (I have a book newly on Smashwords that was previously in print). The big question for self-published ebooks remains: how do we get readers to find us? Hocking is a great success story, but she (and those like her) are still feeling like exceptions. Not that print books, even those by big publishers don't have the same problem--most of those books go nowhere, too. But as more and more ebooks flood the virtual shelves, its going to be harder and harder for readers to find our books. I agree with every word of this. My first book was published 48 years ago, followed by about 20 others, and I have also been the director of two publishing companies. First, the people you meet in publishing are as pleasant and friendly and hard-working as you could ever hope to meet. Collectively, however, they operate businesses which are somewhere between clueless, incompetent, and Oh my God. Warren Buffett has said, as I recall, that airlines, as businesses, have never really made any money; and the same can be said, I believe for publishers. Certainly UK ones. Second, Jason Epstein pointed out, ten years ago, that established big sellers don't need publishers at all. They could afford to set up their own independent arrangements and do much better financially. Now this is true of all writers. Third, there is a much overlooked feature of digital publlishing, which is that the formatting procedure (set out so capably in your book, Mark) imposes a beautiful (aesthetic?) simplicity upon the prose. For fiction (though not for all non-fiction), this focuses the reader's mind on the narrative in a way which is superior, imho, to the experience provided by a printed book. Thanks Patrick. Yes, Konrath and Hocking are the exceptions. In the presentation I called out 50 other indie authors who are showing great promise at reaching readers. One of the most exciting characteristics about ebook publishing is that success can come suddenly and without warning. Ruth Ann Nordin's books have been in the Apple iBookstore for almost 9 months, and then something happened and she broken out suddenly just in the last two weeks. She broke out at Kobo nine months ago, where she's now occupied their best-seller lists for a long time. The breakouts happen at different times and different places. Ruth Ann is outselling Amanda at Apple, which tells me Amanda's breakout at Apple is still to come (this too is very exciting to me since we distribute her there). All these different retailers are like their own disconnected islands. Speaks to the need for authors to maximize distribution and then throw marketing love at each of them. Excellent post! Your discussion about a loss of faith wasn't something that I'd thought of consciously before but now I can see the erosion of it in my view of traditional publishing. It is the underpinning of my decision, whether I was aware of it or not, to begin self-publishing my backlist. Now it is a more conscious decision when I consider my options for the future. As traditional publishing loses its stranglehold on production and distribution, we writers find a greater freedom in being able to tell the stories we want to tell. Now the real winners are the readers. And I don't have to have any faith except faith in myself! A revolution or more correctly I believe a change of business practice is a coming. Much like sport scouting, the samething is going to happen as Agents have to scout out the talent in the indie world. It is going to be a long time before the gatekeepers hand over the keys, especially when they can make quick bucks with the next flash-in-the-pan celebrity bio. As an Indie writer myself Smashwords has allowed me to connect directly to readers, and it has been an amazing experience. While I'm no Amanda, Ruth or David I'm enjoying seeing my work read and the pocket money I earn is a treat for me and my wife at every few months. A discussion last night with a traditional published Author, an amazing writer, made me feel bad for them, as I learned they were earning virtually nothing per book they sold. While I was earning more per unit at a much lower price. It was eye opening for us both, and we both went our ways with differing feelings of wonderment. Another discussion with a fustrated writer opened there eyes to the Indie route, and the satisfication of getting their stories read. It was like a rebirth for her, and I hope power her to dip her toe. I cited the Amanda example of how indie publishing doesn't hurt your chances, and indeed might be way some of the best stories may ever be told. I think this is also a wonderful time for indie cover artists. There is some beautiful work being seen that would never have made it off the computer screen. (Robin, Intense Whisper, created Zoe Winters covers as well as Susan Bischoff's) Some authors are flexing creative muscles and doing both the writing and the covers. Some aren't so great - Some are simply amazing. Personally, I won't take part in an organized revolution. I don't think that's what you are promoting here, Mark. I am trying to focus on the story I have released and the ones I'm working on. Mark has always been quite upfront regarding the potential low sales for new authors. The Smashwords Book Marketing Guide is a must read for all authors, and any author considering self-publishing. Authors must be both business oriented and creative if they want success. They must promote their works everywhere and anywhere they can. (A little self-promotion: Authors can, for instance, post their works on the Smashwords Forum. The bottom line is, I'd don't mind earning a few cents each time someone reads my ebook. Mark distributes ebooks very well, and works hard at making his business a success. His success helps all authors become successful also. Change is coming, and I suspect faster than most people think. Big systems once they finally reach the point of collapse tend to do so quickly. I do wonder if at some point the Big 6 will attempt to purchase prime virtual retail space the way they do now in the box stores as an attempt to place their authors and interests above pesky independent authors. Obviously, they cannot do so now because that would be admitting they have a problem. Excellent article, Mark. Many writers, myself included, have gone through the frustrations and time wasted in trying to find an enthusiastic agent and/or publisher. Self-publishing has given us a sense of freedom and not having to wait months upon months to receive “permission” to share our work. This is a publishing revolution taking place and it feels darn good to be in control of my work and the work of my late husband. I’m delighted. May a thousand novels bloom. It is, indeed a revolution. It will definitely be interesting to see what the future brings. I think it's important for us little guys to remember that you don't have to be a "one to watch" or a bestseller to make this worthwhile. I'm relatively new at e-publishing and sold about 300 copies of my novels last month, not enough to make it into any Top 100 categories for the Kindle (though I do sell better at B&N), but I price my novels at $2.99, and the money does add up. Of course, I hope I'll do better as I put more books out, but I suspect even these lowly earnings are on par, or maybe even better, than what many traditionally published authors see per month. "The big question for self-published ebooks remains: how do we get readers to find us?" I've had some luck with guest blogging, doing blog tours, and giving away a short story as a freebie (that's when I started seeing sales at B&N). I'll be releasing my first novel as a free podiobook soon, and I'm hoping that'll help build awareness too. I think that sort of thing is more effective than spending a lot of time in forums and the like. Great post, and the metaphor of revolution is a good one. One other thing that self-publishing allows that traditional publishers do not is an easy path to editing and improving your books even after they are published. My wife, Gina Lake, and I have edited and improved our ebooks and our print on demand books several times in the last few years, including creating new and improved covers. This kind of constant refining of a writer's work is very rare or difficult once your book has been published by a large publisher. It is so cool to find a typo or poorly constructed sentence, and yet know that it will be corrected in the next copy of our book that is sold. We are still waiting to break out on one of the Smashwords distribution sites, but my wife's ebook, What About Now? which is priced at just $.99 is now in the top 1000 on Amazon. What a thrill! It's an exciting time to be alive and to be a part of this revolution. Self-publishing is a whole new level of free speech and creativity. I've self-published on Smashwords for a few months now and it's been one of the best experiences of my life, whether I'm making money or not. I know from emails I've received from readers that I've tapped into a market the publishers would've told me was non-existent. I can't wait to see the publishing houses go the way of the USPS or the photo/film industry. I think, within my lifetime, we'll see the industry either crumble completely, or revamp itself into something new. When I was in high school we were told not to major in accounting because software was going to come along to make accountants obsolete. Well, I became an accountant anyway and I can tell you - 18 years after that high school assembly - the advent of accounting software took the profession of accounting to another level and didn't make us obsolete. The publishing industry could do the same thing if they play their cards right. Self-publishing is NEVER going away. The publishing industry would be best served to figure out how we can all work together, and fast. Otherwise, they'll be just like Kodak or Polaroid - trying to hold on to the past when the world has already moved on to digital cameras. I hope to see more self-publishing authors really take the time to put the best product out possible as it becomes more and more common. If we want respect, we need to be on par with traditional content. I've always thought the best idea is to do your research and serve the specific book the best. Does it fit the mold to send to NY? By all means. Who doesn't want to see their title in a B&N? Diversification is great for your portfolio and great for the author. Whether you're on Smashwords, Amazon, an e-pub, small pub, big NY name - we all have options. I'm just glad the 2000s have GIVEN us options. I look at Smashwords like it is a school for fine writing,.....and formating. I have learned so much about what markets and what reads well from just these last four works that it is refreshing to see the reaction of readers by reading the reviews. One aspect of self publishing with EBooks takes me back to my first two printed fiction novels. I did all my homework and then contacted a large distributor. The first interview gave me an idea what was in store for people that jump into the publishing industry without proper preperation. the distributo asked if I had the book in paperback in the "airport size" which I didn't my publisher/printer only provided it in one size of paperback and one size hard cover. I lost that one but learned something. EPub is the answer. The only difference in your work is the format required--not the physical size. If the novel is successful in EPub then we'll consider marketing it as printed media. Now that is a switch in tactics. Nicely drawn parallels, Mark: revolutions such as those now underway occur rarely and change forever our societies, our cultures and ourselves. The abandonment of traditional publishing for electronic publishing will prove as transcendental as Gutenberg’s invention of movable type, catalyst for Renaissance and Reformation, prying loose church and aristocracy’s death grip on words and thoughts. This isn’t over. Those forces that’ve have so successfully corporatized traditional publishing and communications will try to do the same to ebook publishing, arguing that they’re bringing much-needed order to the mad confusion of bulging virtual shelves—helping readers make the best choices. And that they’ve the resources to do so. Take over could follow takeover until there is but One Source, albeit with different tributaries, Smashwords being the first logical acquisition target. Just a dystopian thought on a rainy Florida night. Now back to converting my yellowing backlist into ebooks—which I’d never be doing without you. Thank you, Mark. As an Indie Author, what can I do for myself? Well, to start with, I can use Smashwords as a vehicle to get my works in front of readers, including onto other sites, such as B&N, Kobo, and (soon to come) Amazon. I can be in this for the long haul. We can't all be super-successful Indie authors such as Amanda Hocking or Brian Pratt. We need to market for ourselves, and we need to keep at it! I maintain a blog, and post to it at least 4 times per month, and not just about my books. I've posted about such things as eReaders, eReader software, and the price of eBooks.. And, guess where some amazing blog view numbers are coming from? That's right... the price of eBooks, and eReader software. The main thing is that people are viewing my blog, and that creates follow on views of my book pages. 5. Don't ever give up! All of this adventure called writing and publishing is possible because of people such as Mark and his Smashwords team. I’m enjoying this great ride! Thank you, Mark. Mark, what a wonderful post. It certainly reinforces my belief in the fact that I'm on my way to success. Most of my sales at present are coming through Amazon, but I've started to get just a couple now through Barnes&Noble and Kobo. I am excited and hope that suddenly my sales will increase, like they did for some of the other authors. I still post the interview I did with you on The Lit Chick Show and I've had so many authors thanking you for the interview. It was very inspirational! Don't forget to let me know if you ever return to Sydney. I would love to do a follow up interview. Many years ago, I read a book titled The Promise of the Coming Dark Age by L. S. Stavrianos (1976). In it he reminds us that the Dark Age following the fall of Rome was a time of birth as well as death. He said that, "The Western world today is reexperiencing the decay and despair of its early post-Roman centuries, but it is also reexperiencing their sense of creative renewal and anticipation." He also speaks of a move from what he calls "aristo-technology" to "demo-technology," which we can see accelerating today with personal computers and the Internet. All this will bring down much of the establishment in the coming years. Big Publishing is standing by helplessly while the advances in technology sweep them away. And what's coming is nothing less than the liberation of the human spirit. This is much more important than just the fall of an industry. Big Publishing together with the control exercised by Big News and government has cramped the human spirit and controlled what we know as the truth about what is going on in the world. With the advent of the Internet, society as we know is completely being recreated. These institutions are all going to fall, or at least undergo a metamorphoses that will leave them unrecognizable as our current institutions. Our government will go from being a representative democracy to a participative democracy. But the change is even deeper than that. As individuals and as a global society we are undergoing a psychic change that can only be explained by the psychology CG Jung. We are becoming a different people. So much so as a matter of fact, that I believe it's description is only approached by the Arthur C. Clarke novel Childhood's End. This is an amazing time. I never thought I'd live to see it, but here it is. Mark, thanks for the shout-out in your presentation. It is truly an exciting time for both authors and readers, and I thank you for your work in making our books available to more and more readers. Thanks for mentioning me in the presentation, among such fine company! The Big 6 caused much more among writers than the sense that perhaps our stories weren't "good enough"; many became seriously depressed over being rejected so often. Thankfully we now have someone who believes in us besides we ourselves, and somewhere to publish our works wrought from intense passion and agony. If not for Smashwords I would have missed out on such literary gems as Monster Story by McCarthy Griffin or Dangerous Times by Phillip Frey. Sure these eBooks needed a bit of polishing to make them perfect in the publishing sense, but these and many others are excellent stories despite their minor discrepancies and deserve to be where the public can easily and avidly read them. Thanks for all you and Smashwords have done for us, Mark. After over 20 years in traditional publishing, I spent the last two years watching this new paradigm emerge as my old job disappeared. It's a learning curve for all of us. I am reaching thousands with my free e-book. I love being able to give something of value to anyone who cares to download a free e-book, and love that some come back to buy my other books. Smashwords payments are growing every quarter. As a non-fiction writer, my sales are modest. I think the biggest market is for fiction, but I believe non-fiction will expand. It's true passive income, so no matter how little or much I make, it's more than I would have made without Smashwords. From my research of the last two years, I see parallels between the e-book revolution and the micro-stock photography revolution. Crowdsourcing and new ways of using digital material and emerging markets with new uses and ease of access create many more ways for people to find photos and e-books than existed in a sales chart driven business. My marketing has been minimal, with blogging and some social media as the focus of my main efforts. That, and handing out business cards offering a free e-book to people. I think the free e-book helps people find me, but I'm also seeing others including my books on their lists and blogs. As people discover an author's work, a synergy begins to happen. Going "viral" in some form to some segment of a potential audience helps e-books have a life of their own beyond an author's marketing efforts. An author has to market, but I believe as time goes on we'll see other reasons an e-book begins to sell. I have worked with some great publishers and agents, and am glad to have had the experience in the old paradigm (including working a year to get the rights to a book back after a publisher bankruptcy). I hope the Big 6 become open to creative synergies in new ways with authors. But I'm glad that I can self-publish on Smashwords and not be dependent on traditional publishing. I popped onto your PowerPoint show and almost spit out my mouthful of espresso. The Question 1 your posed has been my mantra for years now, when decided if I should court agents or publishers. Excellent call to action. Wonderfully full of facts and passion. Two things I believe Authors must focus upon: 1. creating their best 2. banding together to promote new work. These two points can be accomplished together. Author pages are often single not very polished websites - we can promote other written work by linking together and creating "groups". I have seen many new offers to review work in exchange for becoming part of such an entity. Perhaps also we share how to make our work excellent and different than the formulas used by traditional big box as I call them systems. Raise the flag for us. Mark and everyone. Discovered your post from a Tweet by @Bookgal. And thanks for validating how I've been feeling for years. I'm writing an eBook right now on Branding and will be going through my previously published work for potential eBooks. Whether we like it or not, let's face it, this IS the future. The iPad and Kindle are proving it. Publishing is broken and this is the fix. Writers don't have to endure rejection because trad. publishing isn't our only option. At least this way, we can be accepted or rejected by actual readers. Kinda like modern-day artists. Imagine that. Hi Mark. Thanks for sharing this. Good stuff. I, for one, believe that the traditional publishing players can play an important part in the new paradigm. Publishers have decades of marketing/promoting experience. They have decent understandings of readers and what they want. And they have money...or know those who do. Agents, as a group, network like many of us only dream of. They often have editing backgrounds and understandings of how to make a decent book much better. I've even been thinking about agents becoming the middlemen/women between writers and tiered local/regional/national/global advertising, or other capital, sources. However, all this hinges on the traditional/legacy publishing world taking on a whole new role and understanding of things - from gatekeeper to facilitator, from master to servant. If they can/will transition (and humble themselves) to a support role in the writer's journey I think we can all benefit. How many indie writers would be willing to give a small slice of their profits to have someone on their team who would promote/market/edit/improve their product? Can we do without their help? Yes. Can we survive doing all our own promoting, marketing, networking, editing, and writing while we work other jobs to pay the bills? Yes. Is that what most of us want? Maybe I'm wrong but I think there's a solution here (or eventually) where the writing community can become more successful than ever, in every sense of the word - quality, exposure, sales, earning a living, etc. Where we don't have to be the expert in everything but can share the load with others who are. Of course this would require some mechanisms to protect the writer/creator and their primary place in the new kingdom. And the traditional/legacy folks would need to earn equity in the writers' hearts and minds through years of honest service. Do I hear the strains of La Marseillaise in the background? Over the past 4+ decades, I've had over 30 books published by traditional publishers, and never achieved a status beyond that of midlist author. I don't want to do that any more. If I'm doomed to be a midlist writer, I might as well do it on my own terms. One fact that's been implied but not explicitly stated in all these comments is that the definition of "success" is changing in the new paradigm. Traditional publishers have huge overheads. They must maintain suites of offices (usually in New York) with hordes of employees and all the incumbent expenses. To be considered successful in that world, a book must pay back all those expenses (plus expenses for the unsuccessful books as well) and make a significant profit besides. Anything that doesn't is considered marginal at best, a failure at worst. As an indie publisher, my overhead is vastly smaller. I can survive with far fewer sales. I can be happy in the niche markets the Big Boys curl their lips at. Like the tiny mammals that ran around in the grass at the feet of the dinosaurs, I can thrive quite happily without being as big as they are. I agree with much of what has been said here. As someone who has been published both ways, I’m thrilled with the direction things are taking. One thing I wanted to emphasize is the ‘gatekeeper’ concept, and how the new dynamic is changing that. I remember years ago being in a writers group at a college. One writer set her piece in Afghanistan (this is before 911). I remember the teacher telling her that the ‘trads’ would not be interested in acquiring anything set in that locale. Another writer who had set their story in South America received the same caution. I remember also being at a party for an author who had sold his first book. His agent came and talked to the group, mostly writers. She was asked if she ever rejected something that she felt was deserving of publication. She told the story of a manuscript that came to her, in which a writer made a compelling case for capital punishment, in a beautifully written, compelling novel. She rejected it. Why? Because she didn’t believe in capital punishment. This re-inforced feelings I’ve had about the gatekeepers for years. What personal biases does a story have to overcome to see light of day? And not just the agent’s, what about the editor, the big city daily reviewer, the chain buyer? Good books, writers’ dreams, being slaughtered and crushed before they reach a single reader. It's a crime. But with the new publishing dynamic it will happen less and less. So this is a parallel benefit of the new dynamic. Not only can writers begin to finally make money from their work, but now works that might be controversial or politically incorrect can rise, giving their authors’ a voice. Like so many others here, I've moved from traditional publishing to indie publishing, largely with my backlist. After re-acuiring the rights to my books, I put them up on Kindle, and then discovered Smashwords. I've only done reasonably well on Smashwords, but Kindle, my book sales have gone through the roof, and I npow have four books selling at a rate of 10,000 copies a month. The other small-press books are reaping the glory from the indie books, and are also picking up steam. I'm hearing other authors say they are doing far better on Barnes & Noble or Smashwords than on Kindle. I think that's because most readers are tied by their devices to specific distributors. But I think that will also change in the future. For me, this is a success and fame I never thought would be mine because Big Publishing, no matter what awards I won or how fabulous my reviews were, didn't want my kind of story and, I'm sorry, I just can't write the kind of story they wanted. But it's clear to me now there are thousands of readers who really do love my stories. Without the e-revolution in publishing, I would never have known that. No matter how much I believed in my stories, I would have always believed I somehow just didn't get it. I don't know if the new generation of readers is different, or if they are the same ones who, somewhere around 1990, gave up going into bookstores because they couldn't find the books they wanted to read. Maybe, now that they have a new way of reading and a new source of books, they've come back to us. And they're not afraid to try new authors or books. I will agree, though, for all indie authors, the hardest part is getting visibility. With so many authors taking their own publishing career into their own hands, it's hard to be found in the first place. Not only is the print book on the way out, so is the paradigm of selling books itself. Every day readers are less willing to buy content---any content, whether news, film, music or fiction. What is more, the concept of the book as a unit of writing is itself as outdated as the printing press. Wattpad.com bills itself as "The most popular ebook community." Their free fiction downloads are not 'books.' They are more like tweets with a dozen or so installments of two or three paragraphs each---must less taxing on shrinking attention spans. These are the unedited writings of those who have never studied the craft---and they have up to a half million readers. Wail and beat your chest all you want, but this are the future of publishing. Although I had some titles which were published by "traditional" houses, I also turned to independent publishing for many of the reasons other professional authors have cited. One of my main issues continues to be the disdain which many review groups and others view "self-published" titles. Many will not accept any self or independently published titles. This lead me to begin my indie review/interview site "Flying With Redhaircrow". Just since the time of its creation 31 October 2010, I've been privileged to read and review some excellent work by Smashwords authors. My comparisons? I do reviewing for two "traditional" review groups which receive mainstream, commercial, and other fiction of all kinds. By majority, Smashwords authors can stand up to those, equalling if not surpassing "regular" writers. As a writer myself, I've experienced the biased, stereotypes and brush-offs others have experienced. You know what I'm talking about. Your work is not inferior. You care about it deeply and it's a part of you. You reread, edit and revise to make it the best you, but in many cases are not recognized for it. I think that should continue to change. It is harder and harder with so many titles flooding the market, but there is a fallacy that just because it is indie, it is less than others. There are strong elements of elitism over indies. There are many other variables, pro- and anti-, but I do not believe someone should be dismissed just because they took personal initiative to publish, market and advertise their own work. I agree that Kindle, Smashwords and ebooks in general are revolutionizing the industry. Much like twitter and Wikileaks have helped spread democratic urges in the Middle East, digitalization has created a new playing field in media. It has helped us get out of the control of editorial boards and committees who knead and reshape "publishable" novels so that they adhere to a "target" audience of readers. With sites like Kindle and Smashwords we are able to read books that are more like what the author had intended. This may sound contradictory, but what we are able to purchase is "real" fiction: not reshaped by a team of editors. To top it off, we are able to enjoy these "real" books at a fraction of the cost of "corporate" or "mainstream" products. Yes. This revolution will change the face of publishing forever and place the power where it belongs: in the hands of the individual authors. Our writing careers will be our individual responsibility, which is both exhilirating and scary. This is an exciting opportunity to escape the limitations and oppressions of the Big Publishers, but the freedom we gain as authors must be handled with care. To overcome the traditional stigma attached to "self-published" authors (which I suspect has a lot to do with the publishing powers' attempts to keep control - readers only want a good book, they don't really care who publishers it! )we, as indie authors, need to set the standards bar as high as we possibly can for our stories. Our complete final product must be the best we can make it. If we responsibly self-monitor our work to give the readers value for money, then we can keep the freedom we have. The biggest danger present in this birth of a new era for authors is the possibilty that the self-publishing arena wil have to impose rules and regulations to prevent abuses by its authors. At that point, we will become the very thing we have broken free from. As the power in Egypt and Libya shifts to the hands of the people, I hope that the power of publishing continues to shift to where it belongs: the authors. And I hope that that power is used wisely and responsibly by every self-published author. Thanks for the excellent post and presentation, Mark. They're thought provoking and that's exactly what everybody needs - to think about where the publishing is heading for. I'd like to add another association about big-vs-self. Traditional publishing is for authors like applying for visa to a dreamland. Only few get visas, out of which only few become residents. The most fantastic thing about self-publishing is that you don't have to apply for visa any more. You can create a dreamland without leaving your home. In my opinion, the publishing industry dynamics is more about abandoning old destinations rather than uprising. And this is good. Big publishers will have to be more innovative in finding opportunities outside the old model. There's a huge energy and hidden driving power in self-publishing. The sooner we find ways to embrace it, the better. Similar topic to this discussion. I’m old enough to have seen this revolution several times before. I’m not a rap fan, for the record more a connoisseur of R&B and New Age. But I watched the revolution take place in music, specially rap music right here in Houston where a bunch of street hustler (Scarface and the Geto Boys) started selling forbidden CD’s out of the trunks of their cars. This was music none of the major labels would touch because they were the power brokers and “Knew” what was best for the market. Russell Simmons is the third richest figure in hip-hop, having a net-worth estimate of $340 million. But he started his record company, Def Jam, because every single record label turned him down. Their antiquated business model told them there was no market for this kind of music. Of course, we parents were hoping they were right. But they weren’t right. They had lost touch with the end user. So have the big New York publisher. Thank God for Smashwords. Hi Mark, Thanks for speaking the truth. I'm also grateful that you still allow indie authors to post our "Freebies" for free. I'm publishing my supernatural thriller, REUNION, on smashwords in a couple weeks and can't wait. I have a 45 day blog tour scheduled and have had to work really hard to develop my own platform without the help of a trad publisher. If I'm responsible for doing that anyway, why on earth would I hand over higher royalties for the favor of getting published. Looking forward to working with you. I'm an Indie ebook author and my paperback publisher is PublishAmerica, a hybrid POD. My books might not be on the Times Best Seller list, but people enjoy them. Paperbacks are expensive no matter where they come from. When I started, I was dished out nothing but the "big publisher" retoric. All I had to do was sit and wait for their eventual doom. It's a joke, a farce that talent is wrapped up in "brick and mortar" ideals. Now its our turn. This is a revolution worth joining. I remember when ebooks came on board. Ohhhhh....no.....ugh.... Geez..Barnes and Noble has to go exclusively ebook. What is a book to do? Long live Indie! 3) Develop and maintain marketing venues to attract and service readers looking for worthy books. When Amazon and Smashwords and other services provided a quick and cheap and easy way to get books published, average-Joe authors suddenly gained direct access to make any book – no matter how innovative or terrible – almost instantly available to readers. This effectively eliminated the big publishers as gatekeepers ‘standing in the way’ of all the average-Joe wannabe authors out there. However, distribution services like Amazon and Smashwords do not provide the publishing house production services of editing and cover art, nor do they provide any marketing beyond the basic web site product sales page with inherent category search. When it comes time for average-Joe author to figure out how he’s going to get his book professionally edited and formatted, and his cover professionally produced, he has two choices. He can either buy all the necessary software and learn how to do it all himself, or he can pony up a couple thousand dollars to pay others to do it. Which option will average-Joe author choose? For most people who want to get published, the do-it-yourself route (done right) looks like way more trouble than it’s worth and way more expensive that it’s worth. So most people will either throw up their hands and give up, or just pick the quick-easy-free way to get their book published, which involves no editing and just a rudimentary ‘freebie’ self-designed cover. To justify this, average-Joe author rationalizes that readers don’t really care about typos on every page, or whether the story makes sense, or whether it’s interesting, or whether the cover looks like a two-year-old did it with Crayons. Once in the marketplace, average-Joe author’s book will have no respected reputation of a big publisher to stand behind it and promise the reader that it’s going to be worth the time and money to read. And not only will average-Joe author’s unknown-quality book be competing with way more books from other average-Joe authors, it will be competing for attention and money from a slowly shrinking readership that is shrinking due to other entertainment options (video games, TV, and other electronic distractions). Thus the average reader will be overwhelmed by a flood of books by unknown authors without any reputation whatsoever to promise that their books are worthy products. Getting published or going the self-published route both take a tremendous amount of time and effort. With one, you have to sell your work first, then wait a long time to get your work published. With the other, you have to publish your work, then wait a long time to sell it. Either way requires perseverance and a tremendous faith in the work. Anyone who is easily discouraged will give up before success is realized. Anyone who looks for the quick and easy solution without taking pride in their work to ensure it delivers in both packaging and content will fail because the product will be perceived as inferior. Anyone who thinks it will be a piece of cake becoming a successful author – and in this reference, ‘successful’ means selling more than 5,000 copies of a title – is in for a disappointment. Only the author who has good product and sticks with it to look for great ways to publicize and sell that work will see the kind of success the ‘exceptions to the rule’ appear to be now enjoying. Hey, what can i say. It aint rock n roll if it aint a revolution. I loved this post, and it speaks to exactly how I am feeling about publishing. I have been wanting to write a book for ages, but after receiving copies of book proposals from a friend, I lost all interest. The proposals were books in themselves. I'm excited about putting my book out there to see where it lands. It truly is a revolution. At the risk of turning off "Non-Indie" readers, I believe that indies will rise and become a serious threat to big publishers. They seem to be, to many, many writers, a king taxing poor writers from across the ocean without proper representation. With traditionally published books becoming more dependant on the blockbuster hits, overlooked authors such as myself and best-selling indies, have no other choice but to make a run on our own, and be our own publisher. Why wait? Why depend on the gatekeepers when there is an open range of affordable publishing opportunities out there. Of course the road ahead will not be smooth. It will be filled with potholes and steep mountain cliffs and cold winters in the learning curve. But I cannot help but to shove aside the urge inside of me to give up and hold out one, two, three or four more years until that one agent and that one editor decides my work is good enough for that one publisher. Life is too short. I have too many books to write to wait and see them in print AFTER I'm dead and burried. Now is the time to throw off the shackles. Now is the time to overthrow the King. Now is the time to declare our indie-pendence and plod through the muddy road of publishing, giving all we have and our very best to win the hearts of readers. As in times past, the human spirit has declared over and over that it will make its way on its own and be all the better for it. The Kindle, the Nook, the PC and the iPad are all devices that have introduced game changing technologies that have unlocked our chains, releasing writers from the tyranny of the publisher - paying scraps for those who produce the products of their riches. The writers of the world are now free. Dinosaurs are dead for a reason. What a fabulous discussion! Thanks for sparking, it Mark! And thanks, too, for the shout out in your presentation! Smashwords has opened up worlds of possibilities for me and for so many other authors. I can't thank you enough. I also want to thank Delle Jacobs, who commented here. Like me, she's a well-heeled romance writer who did everything right. We learned our craft and were repeatedly judged by our peers to be worthy of finaling in RWA's premier contest for unpublished romance writers (though Delle did it far more often than I did!). Yet to get published or stay published by mass market publishers seemed an impossible dream. Delle had the courage to strike out into these Indie waters, and I was inspired by her success to try to follow in her path. She has also mentored countless other authors, helping them to do the same. There *is* an appetite for our stories. And thanks to the platform that Smashwords gives us, our books can sit on the same virtual shelves as a New York Times bestseller. While publishing is certainly changing, I think it's rather tacky... NO... VERY tacky, and outright disturbing that you'd use the revolution in North Africa (where how many have died?) to open your post. And before anybody decides to harp on me being one of those authors who 'fear' change-I was an epublished author before a lot of people even knew what ebooks were. I've got books by traditional publishers, ebook publishers, and I've done several of my own. I believe in doing what works best for me as a writer... period. Your opening left a bad, bad taste in my mouth. Is publishing changing? Yes. But it's unlikely authors will die in the process. People, many of them did die in Egypt-I have friends there as well. Publishing will change-it has to. That's how things are-what doesn't change and grow will die. Some traditional publishers will weather the storm, whether anybody here wants to acknowledge that and plenty of readers are happy for it, because they still want those traditionally published books. The publishers that survive will be better for it. Those that don't survive? That's business. Call it a revolution if you will, but comparing this 'revolution' to that one? No lives were lost in this 'revolution' nor are they likely to be. In North Africa? Lives were lost. The words you used were thoughtlessly thrown out, IMO, in a sensationalist manner, which happens. But this was cruel. And it shows a marked lack of compassion for human life, IMO, Mr. Coker. Since 2002 I start looking for a publisher; and I live in a third world country named El Salvador, big publisher had only retailed agencies in my country, and they do not accept material from authors. The internet was my option and soon. I discover that Self publishing was the solution. I made a co-edition agreement with an editorial in the US that did not work OK, but at least I could have my books, register in the US Congress. I continue investigating all e-book's systems and try a few, but the multiple formats where the limitation that stopped me. So I continue writing and publishing by myself in paper. The year went by and finally I found that a guy name Mark Coker, with the same frustration I was carrying; It invented a system for Self Publishers,that will include all the e-books available formats. And the cost was CERO; this was incredible. I decide to go through, and it took me some time until I publish my first work. Now I have four books of my own and have helped a lady poet friend to publish here work. Can you believe this? Furthermore, there are not shipping fees or border to stop my books and be available to my niche market "Salvadorians living around the world", and also important, we publish causing no harm nature. I was realized; but a few years later Mark gave us another great news: the Premium Catalog, and now my books are in Barnes and Noble, Apple and Sony Books and soon in KOBO, DIESEL and AMAZON. This was awesome. Without entrepreneurs like Mark, there is no way my dreams could survive. To day the MEGA Editorial had absorbed every little specialize in a company. The bigger they grow the farther away they are from novice writers. Here is where many writer's dreams ended. Of course they all are now selling e-books in big quantities; as the use to work, they're ending is announced. It is clear the skyrocketing in sales of E-books, in first world countries, where people read more and had more computers per capita. This is not happening in third world countries, this mean we have a lot of work to do. Shiloh, I'm sorry this post struck you as offensive. It's horrible lives have been lost in these revolutions, and it's even more horrible the decades of oppression, torture and murder these people faced by their regimes. In that light, yes, I can understand why you or others might consider my comparison in poor taste. I thought long and hard about these issues before I decided to compose the Powerpoint, which started this, and then the post to accompany it. I bounced my ideas off of several people before sharing them because I wanted a reality check. In the end, I decided the parallels were too important not share. While nothing can ever equal the tragedy of lost lives, I think the conclusions I draw are fair and reasonable. How many thousands of talented writers throughout the centuries have had their souls crushed and dreams destroyed simply because they were unable to share their writing with readers? How many cultural treasures have been lost to humanity for all time? To me, books and the authors who create them are precious. I truly believe, as I've mentioned many times in my talks over the last three years, that books are essential to the future of mankind. As the world gets smaller and more volatile, books help promote cross cultural understanding, and understanding promotes peace and compassion. Books must be saved, and I believe the current system of Big Publishing was on course to cause great harm by squandering the potential of books. This is why I'm so excited - you might call it sensationalist - about the opportunities that lie ahead for authors. I'm building this business to help authors realize their full potential. I pinch myself every day that I have the honor to be a small part of this. The believe the coming publishing revolution is important to humanity, and on that count it deserves to stand shoulder to shoulder with other great revolutions. I appreciate you sharing your thoughts. I don't expect to change your mind or your opinion. At worst, I hope you understand my motivations a little better. The parallels exist in your own mind, or because you chose to draw them. Lives lost. People unable to publish their works traditionally. I'm afraid I'm NOT seeing a similarity there. Nope. Not seeing it. Until you are so passionate about this that you are willing to stand in front of a publishing house and douse yourself in gasoline over it, you are not in a comparable revolution. That is not PC it is a fact. Complaining about it is not a revolution. Writers do die. They commit suicide. The story of Kiana Davenport, brought back from the brink by the hope of self-publishing, is a case in point. I'm sure there are many more we never hear.